Garuda Indonesia's sole Boeing 737 Max 8 taxis at Jakarta's Soekarno-Hatta International Airport. The fallout from the pair of fatal crashes involving Boeing 737 Max 8s in less than five months appears now to have extended to the Boeing’s order backlog, as Garuda Indonesia has signaled to the manufacturer that it wants to cancel deliveries of 49 of the narrowbodies. A spokesman from the airline told news outlets Friday that Garuda has sent a letter to Boeing requesting the cancellation due to a “loss of confidence” in the airplane among Indonesian passengers. 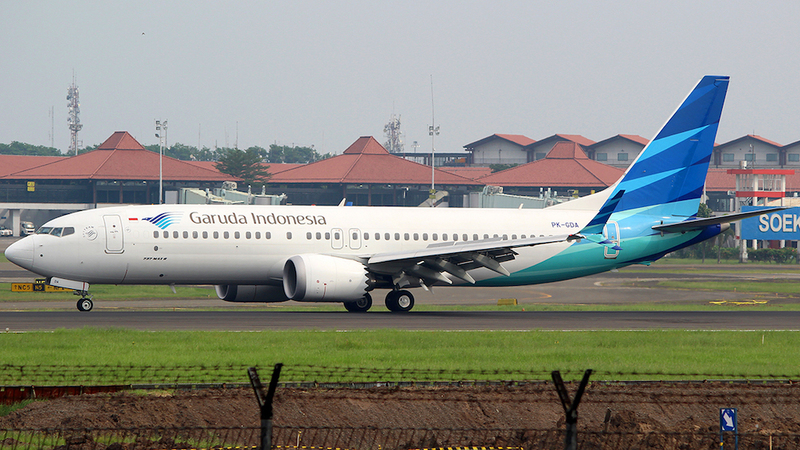 Boeing officials will visit Garuda executives in Indonesia on March 28 to discuss the matter. The airline has received one of the airplanes under the terms of a $4.9 billion order for 50 placed in 2014. The move by Garuda comes as Boeing works to contain the damage to its reputation and finances caused by the March 10 crash of an Ethiopian Airlines 737 Max 8 outside Addis Ababa and the October 29, 2018, crash of a Lion Air Max 8 off the Indonesian coast. The two accidents claimed a total of 346 lives. Lion Air—the largest customer for the 737 Max in the Asia-Pacific region with 201 on order—has taken delivery of 10 of the narrowbodies. It too has “reviewed” its order with Boeing and, according to a Reuters report, has not ruled out a cancellation. Boeing has collected orders for a total of 5,036 Max jets, of which it has delivered 381.